By Kamran Zamanian, Ph.D, and Simon Trinh, iData Research Inc. Sudden cardiac arrest (SCA) is one of the leading causes of death in the U.S. and is responsible for over 300,000 deaths annually.1 As a result of the aging baby boomer population, as well as the increased rate of obesity amongst all age groups, the patient population requiring some form of cardiac treatment continues to increase. For these reasons, upwards of $30 billion is spent annually in the U.S. to manage various types of heart failure through cardiac rhythm management device implantation and ablation procedures.1 Specifically, catheter ablation procedures have become a prevalent method of treating cardiac arrhythmias, and such procedures are expected to experience many changes over the next decade. Catheter ablation is a medical procedure used to treat abnormal heartbeat rhythms — a condition known as cardiac arrhythmia — and typically involves a diagnostic procedure beforehand to determine where abnormal heartbeats may cause an arrhythmia to start. During catheter-based ablation procedures, a series of catheters are put into a blood vessel in the arm, groin, or neck, and then threaded through the blood vessel and into the heart. During the ablation portion, a special lab system sends radiofrequency (RF) energy through the catheters to produce heat that destroys the heart tissues where physicians think arrhythmias may occur. According to the American Heart Association (AHA), catheter-based ablation procedures boast a 90 percent success rate, have a low risk of complications, and allow patients to resume normal activities in a few days. Furthermore, leading companies like Biosense Webster, Medtronic, and Boston Scientific spend millions of dollars each year researching and developing new devices to improve these success rates and to reduce complications during procedures. There are two sub-segments within the RF ablation catheter device market: Irrigated and non-irrigated. RF ablation with irrigated tip catheters is important because it decreases the likelihood of thrombus and char formation, and it enables the creation of larger lesions. Although irrigated tip catheters are, on average, twice the price of non-irrigated tip catheters, more electrophysiology labs are beginning to purchase the irrigated alternative in order to prevent thromboembolic events, which may lead to other life-threatening consequences. 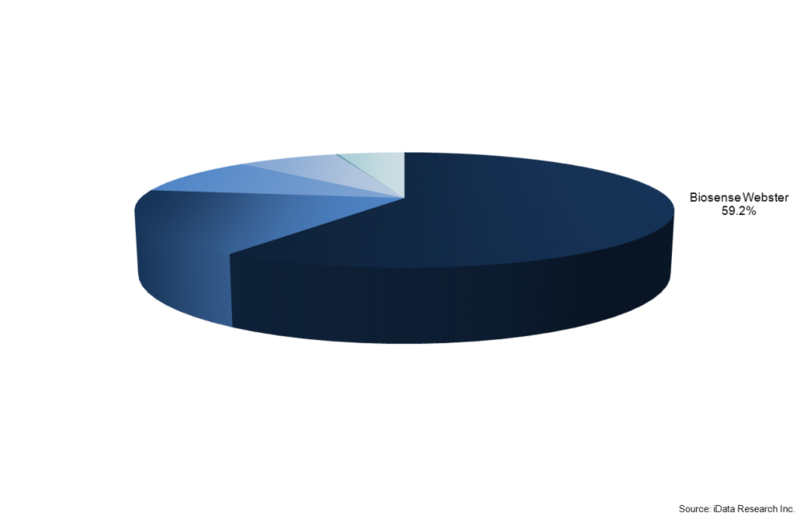 In 2009, irrigated RF ablation catheters comprised of 35 percent of the total conventional RF ablation catheter market. By 2014, this number surpassed 60 percent.2 This market shift has been the largest driving force behind growth in the overall electrophysiology and ablation market for the past several years. Demographic and technological factors are expected to contribute to further growth in RF ablation markets into the next decade and beyond. In fact, the RF ablation market, which consists of non-irrigated RF ablation catheters, irrigated RF ablation catheters, and cryoablation catheters, is expected to experience nearly double-digit growth, annually, through 2022. In addition to the irrigated RF ablation catheter sub-segment, another emerging sub-segment in the ablation market is expected to grow rapidly: Cryoablation balloon catheters. Cryoablation catheters are single-use, electrophysiology catheters designed to ablate cardiac tissue. The steerable device does this by creating focal lesions to treat atrioventricular nodal re-entry tachycardia (AVNRT), an arrhythmia where procedural precision is important. 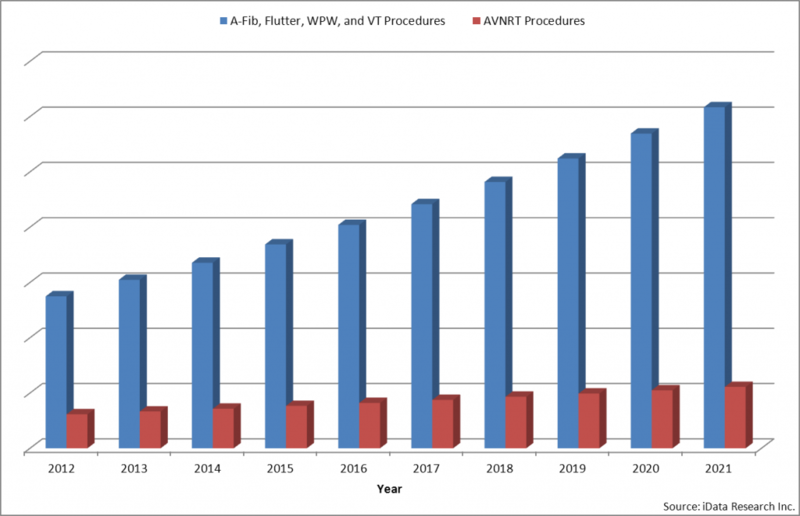 As of 2015, AVNRT comprised of 17.2 percent of the total catheter-based ablation procedures for treatment of cardiac arrhythmias. Given that cryoablation devices are only used for a small portion of all catheter-based procedures, cryoablation will be used far less frequently than RF ablation. However, despite the smaller target market, it is expected that the number of cryoablation procedures performed will increase at a moderate rate due to physicians’ adoption of the product and an increase in the number of AVNRT procedures. Between 2015 and 2022, competitors such as Boston Scientific are expected to make a push into the cryoablation space that will lead to lower average selling prices (ASPs). The current price of a cryoablation catheter ranges between $4,500 and $6,500, but it is expected to fall to a range between $3,000 and $5,500, which will attract more patients and physicians to cryoablation catheter treatment. The cardiac ablation market, which is dominated by four major players, has experienced some minor changes in the past several years due to FDA activity. As of 2015, Biosense Webster was the clear leader in this market with its CELSIUS, EZ Steer, Navistar, and ThermoCool ablation catheter product lines. Medtronic was also a major player with its ENHANCR II and RF Conductor ablation catheter product lines. In certain markets for cardiac rhythm management — like pacemakers and implantable defibrillator devices — product recalls have had serious, long term effects on company brand images because, although these devices have life-saving capabilities, a faulty device can potentially end a patient’s life. However, in the ablation market, no serious recalls that led to major shifts in the market have occurred in the last 10 years, because the extent to which a faulty device harms a patient is relatively low. For example, in 2011, the FDA issued a Class 3 recall for 1,530 units of Biosense Webster’s Duo-Decapolar EP catheter due to product defects. This recall was nationwide across the U.S. and affected company sales for the next several quarters. Biosense Webster has since bounced back from this recall but, for a short period of time, St. Jude capitalized on the opportunity by offering attractive deals to customers who were affected by the recall. The release of next-generation technologies also has had a minor effect on market shares, because such technologies represent a more advanced model compared to the previous generation, which leads to greater consumer confidence in the brand. In January 2011, Medtronic received FDA approval for its Arctic Front product, which has allowed the company the ‘first mover’ advantage to capture nearly 100 percent of the cryoablation market. Increases in the number of catheter-based procedures and the penetration rate of more advanced ablation devices are expected to drive growth in the U.S. market for electrophysiology and ablation devices through the remainder of the decade. In particular, growth from the cryoablation and irrigated RF ablation catheter markets will be responsible for the majority of the growth in this market. Technological advancement from Europe will also play an important role in determining the new devices that will enter the U.S. market, as well as the extent to which physicians in this market will utilize them. Simon Trinh is a research analyst at iData Research and was the lead researcher for the 2016 U.S. and European Cardiac Rhythm Management, Electrophysiology and Ablation Devices market report. He also worked on the 2015 report European Markets for Interventional Cardiology Devices. Kamran Zamanian, Ph.D., is president, CEO, and a founding partner of iData Research. He has spent over 20 years working in the market research industry. iData Research is an international market research and consulting group focused on providing market intelligence for medical device and pharmaceutical companies. iData covers research in: diabetes drugs, diabetes devices, pharmaceuticals, anesthesiology, wound management, orthopedics, cardiovascular, ophthalmics, endoscopy, gynecology, urology, and more.